We spent last weekend at a friend’s ranch in Fort Klamath, on the Wood River. The snow was deep enough to make walking difficult but not impassible. Best to stick to the snowmobile tracks were the center is packed down enough that the snow does not come over the top of my boots when I do break through. I followed their trail along the river, taking the dogs on an adventure. While they ran, bounced, and stuffed their noses in every corner and snowdrift, I plodded along, laughing. There is little more joyful than a dog on a walk off leash. This is snow country; our friend’s place is just outside the south entrance to Crater Lake National park. We drove up to the lodge, where the wind was whipping the snow with fury. The girls and I walked up to the rim and looked at the blizzard where the lake should be. We could see the island, and for a brief moment the snow slowed enough to give us a slight glimpse of the far shore. I was glad for the down hood on my parka; the wind can’t make it onto my neck like in a jacket, slipping its cold fingers down through my collar to my back and shoulders, defying any scarf. The lodge was boarded up for the winter, shutters over the windows and a waterfall of icicles cascading off the side facing the lake. Braced against the wind, waiting stalwart for spring. I had not ever been to the park in winter. I have friends who make the trip to snowshoe or ski around the lake. The North entrance to the park is closed in the winter, so from Bend the trip is a much greater commitment than the day trip is can be in summer. On our last trip to Crater Lake, John and I had been on the river, and looked it as if we’d just come out of the bush. We drove to the front of the lodge, a grand old building built by the CCC, giving work to men during the Great Depression. The bellman out front was dressed as if he were in downtown New York, opening doors for ladies returning from the department store in time for tea, rather than welcoming guests at a wilderness park. Talking with us through our partially rolled down window, dancing the mosquito swat in a desperate attempt to keep the buzzing clouds from creating the inevitable welts on his face and neck, he told us we would be more comfortable at the diner on the other side of the lot. Our river shorts and Teva sandals must not have been the proper attire for the white glove service inside. There were certainly no mosquitoes or bellmen welcoming us this time, as they tend to avoid snow blowing sideways. We do, too, for that matter. 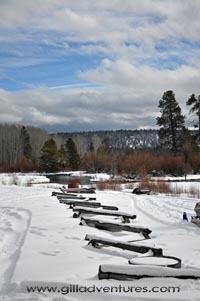 After a quick cocoa in the day lodge, we headed down to Annie Springs Snow Park for some good old-fashioned sledding. Such a simple thing; children, snow, gravity, and a piece of foam with handles. Somehow we seem to forget that entertainment need not be complicated. Careening down the hill, they become as joyful as the dogs off leash. 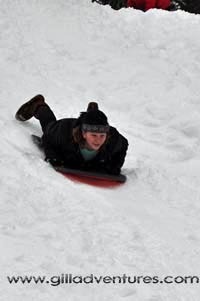 I watch and remember the years of sledding through my own childhood, climbing back up the hill just one more time for the thrill of coming back down on my flexible flyer or old inner tube. Standing by the fire drinking cocoa to warm back up.I imagine back through time, through decades of sledding children and laughter before us. And, I wonder if our own laughter will remain, echoing in this place of snow.